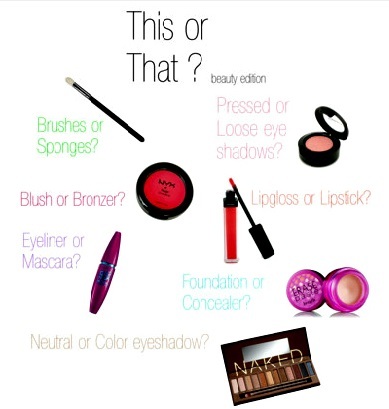 Okay, so finally I’m doing the “This or That” Beauty Tag! It is pretty long but I loved answering every question!! Thanks a lot Revu of HnB for tagging me to do this post!! blush or bronzer: Blush anytime!! I am big fan of blushers!! on a daily basis I love a tint of color on my cheeks!! lip gloss or lipstick: none…I am a lipstain lover; My dailywear favourite is Revlon Kissable Lip Balm Stain Honey!! lush or other bath company: Loccitane any day!! flip flops or sandals: Flip Flops. Comfort at its best!! scarves or hats: neither of them!! cowboy boots or riding boots: I live in a country where I never get a chance to wear any of these 🙂 Back in UK, I loved cowboy boots!! bun or ponytail: Bun mostly!! I have long hair!! I don’t like people noticing or telling about my hair , So, I tie it and make a twist bun or sock bun all the time!! its great for office look everyday!! bobby pins or butterfly clips: Bobbypins!! hair spray or gel: neither!! I use Kerastase serum!! side sweep bangs or full bangs: Side sweep bangs. East coast or west coast: West Coast!! I <3 Vegas! !